ALEX followspots are ideal for longer throw tungsten applications with exceptional optics, quality output, and a warm uniform beam. 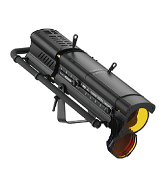 A ruggedly constructed short- to medium-throw follow spot, the Luminator produces a narrow, hard- or soft-edged beam which zooms from 1.3 degrees to 9.3 degrees. ARAMIS is perfect for long throw appilications. This fixture is POA per the manufacturer. Please call us at 800-942-0555 to get our best pricing. BUXIE is the little spot with powerful punch. 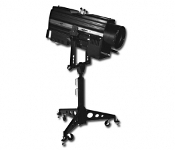 A compact 575 metal halide followspot which produces a powerful, flat, well-defined beam. A 1,000W Tungsten followspot, with optical excellence, the CRICKET is easy to use and can fit into the smallest of spaces. 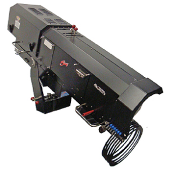 CYRANO's narrow beam angle is suited to super long throw distances. This fixture is POA per the manufacturer. Please call us at 800-942-0555 to get our best pricing. 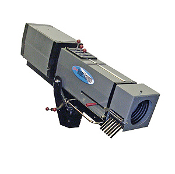 FLO is the first 1800W fixture with output to rival mid-throw 2500W followspots. 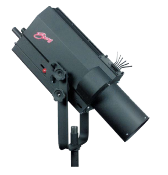 It has similar output, beam angles and functionality, but in a unit as compact as a 1200W followspot. The GINGER followspot blends well with conventional lighting,while providing a flat field, high-intensity beam. Lancelot is not just another very long-throw followspot. It is now the benchmark for big events and concerts, where its innovative technology, outstanding output and extremely flat beam has set new standards. LUCY offers superior output over higher wattage short throw followspots, along with the ergonomic features, instantaneous re-ignition, silent magnetic PSU and compact dimensions. This fixture is POA per the manufacturer. Please call us at 800-942-0555 to get our best pricing. 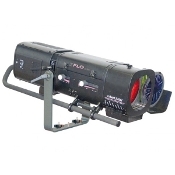 Compact, economical, spread lens for stage flood lighitng. Compact unit with rugges construction, spread lens for stage. The most cost efficient HMI type followspot. The Super Arc 400 features single lever continuous zoom lens system with a 400' maximum throw. 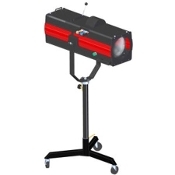 The Canto® 1200 is a high-wattage metal halide followspot using a single-ended G22 base bulb to give a powerful and well-defined beam from the double condenser zoom optical system. The Canto® 250HR produces flicker free output equal to 1000 watt halogen at a quarter of the power. 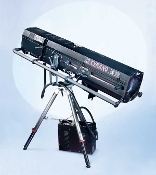 The Canto® 575 is a medium-throw metal halide followspot using either a 6000° K or 7200° K bulb to give a powerful and well-defined beam from the double condenser zoom optical system. The Gladiator IV offers large venue operators and lighting designers a new option at this level. The Strong Super Trouper II produces 10% more light in a structure that is 20% lighter and 25% smaller than comparable units. The Strong Xenon Super Trouper is suitable for trouping or fixed installation. The newest of the “Trouper” line, this unit uses fixed optics with multiple, interchangeable lens options. The award-winning long throw SUPER KORRIGAN out performs followspots of higher wattages, and is widely used in enviroments where high output, instantaneous re-ignition, silent operation and compact dimensions are a real advantage. TOPAZE use a long life lamp and provides a cost-effective solution for mid-size applications. The full range of features bring high quality followspots within reach of all budgets. With a combination of compact dimensions, output which rivals other 2500W followspots, a hot restrike lamp and an electronic PSU, VICTOR has become the new benchmark followspot for large venues.